DH was inspired and uplifted by this “garden”. He just needs lots of little workers to help him and some very big rocks. Chinese private gardens seem to lack blooming flowers (at least this time of year) and go more for rocks, despite their love of flowers in public squares and modern parks. (I read later that this garden is famous for its Peonies in the spring – bet it’s gorgeous!) The buildings were well integrated with the landscape, and doors and windows were well placed for maximum views. In the center of the whole complex was a pond, complete with zig-zag bridges (to keep away evil spirits), pagodas, pavilions, and covered walkways. Many of the little details of the garden were intriguing. The carved screens added to the mystery of many of the garden’s views. The details of the stone walkways included cranes and other animals created with little stones. We could go in many of the rooms. The furniture inside was also very neat – ornate Chinese mahogany. 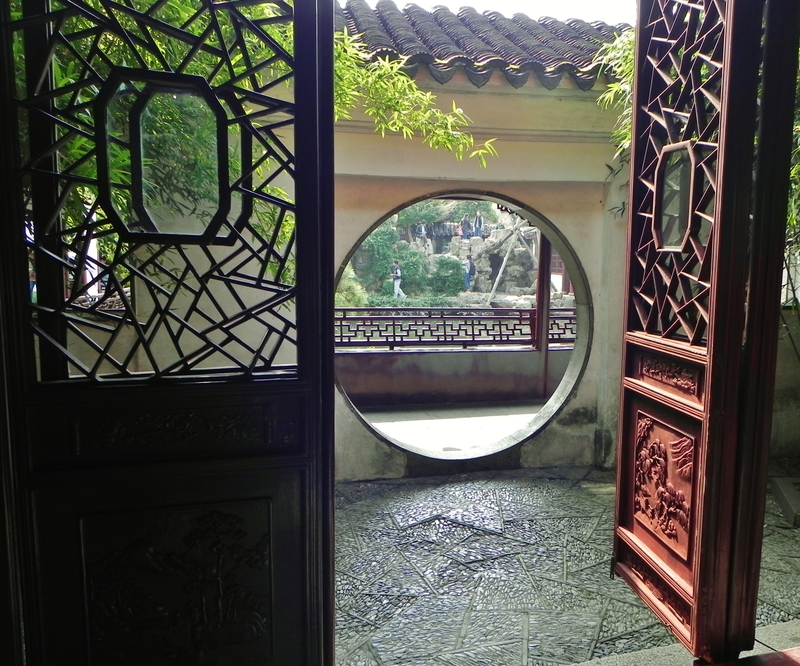 One of the rooms was the inspiration for the Astor Chinese Garden in the Met Museum of Art in NY. An absolutely gorgeous intricately carved mahogany sedan chair was in one small room, but I couldn’t back up far enough to get it all in one picture. There was a blooming tree that Rocky pointed out that was a 100 year old Osmanthus. And a 300 year old pomegranate tree where DH took my picture. It would have been so very peaceful if there weren’t so many tourists about (mainly Chinese here). I would have liked to have more time here. Rocky has a bad habit of keeping us standing in one place and giving us the history and particulars about a place, and then there’s not enough time to wander around and actually see anything. So, I’ve started asking him “if we get separated from one another, where and what time should we meet?” so that I can have a little more ability to actually see something. When we left the Fishing Nets Garden, Sandra decided to start taking pictures and kept waiting for people to move out of her shot, so she didn’t keep up with the group. When we got to the street for our van to pick us up, she wasn’t with us. Rocky went back to look for her. Phillip did nothing but stand there. We wasted 15 or 20 minutes, but they finally found her. This caused us to lose our “good” restaurant in Tongli as they’d be closed by the time we got there. We ended up at a second-rate place in a strip shopping mall, but the food was OK. However, it tasted more like Chinese American food. Bathroom was awful! 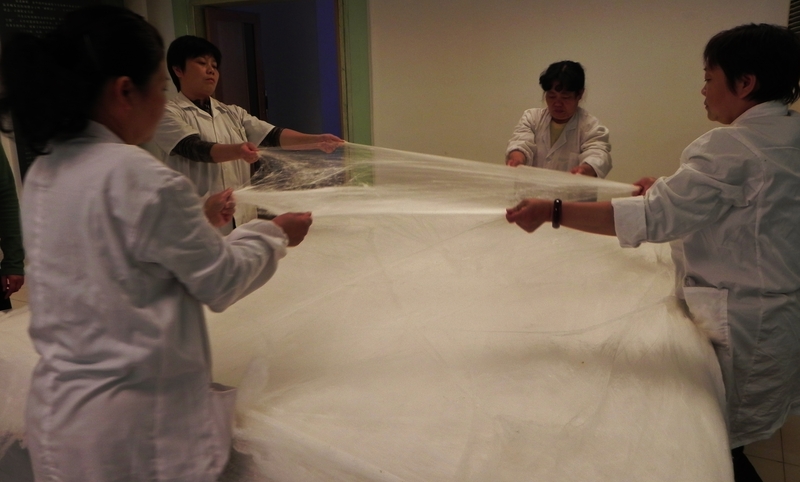 But before we went to lunch we stopped by the Silk Factory that was in Suzhou. Very interesting. (I got most of the process on video, which has since disappeared and I cannot find on any disk anywhere.) These are silk worms munching on mulberry leaves, their favorite food. When fully grown, they let the worms spin their cocoons on various structures, like this waffle looking wooden frame in the picture above. When mature, they pick the cocoons and then cook them in a water and steam boiler to un-gum them. Next they pick off the outer husk by hand. And then they drop eight cocoons into hot water and whisk off the outermost filament of each to start spinning them together as one strand. So eight cocoons go into one silk strand. I didn’t catch when they take out the little bug that’s inside – not sure they went into that part. They spin it a couple of times till they get the smooth finished silk thread. What they call a quilt is actually a silk batt that they pull, stretch and layer by hand – one cocoon’s worth at a time. (I’m sure in a real factory these layers are pulled and stretched by machine.) They let us try this as a group and it was surprisingly easy. They then make these batts into Duvets, but call them quilts. They had some huge Jacquard Looms, weaving some intricate brocade from strung together punch cards dictating the pattern. As far as fabric goes, what they mainly had in the obligatory shop were patterned brocades. They had surprisingly poor selection; given this is the largest silk producing city in the world. They didn’t have any dupioni. I did pick up 3 meters of silk charmeuse in royal blue, turquoise, and purple. Paid 200 yuan per meter (total 600 yuan or $100 US) – not cheap, but at least I got some “real” Chinese silk from the Silk Factory. Put it on the United card since there are supposedly no foreign transaction fees. After our 2-nd rate lunch, we were now on to Tongli. On the way there, we briefly went through a beautiful business development park, well landscaped and very wide streets – no traffic. Could have been anywhere in a nice place in the US. Then went through rather squalid villages, but pretty yellow golden rice fields. The trip took almost an hour. As we got near the town, the quality of the housing got noticeably better. Some gated communities and very nice homes. An amazing number of them were vacant however. 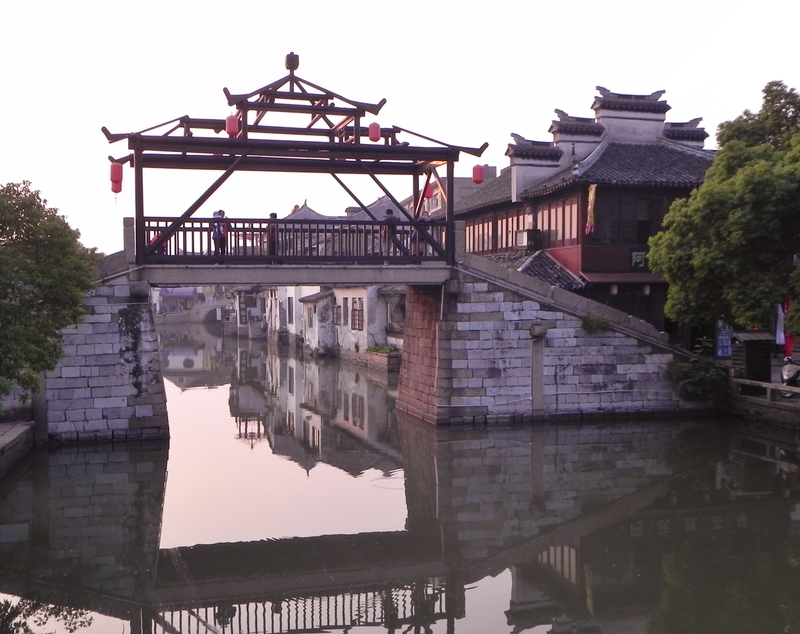 Tongli is know as a Yangtze River delta “water town” due to its many canals. We drove to a parking lot just past the main town and transferred to a 12-person ”golf cart” like the kind we’ve taken before. After another harrowing ride, even in this scaled down conveyance, we were dropped off in a busy shopping street with lots of noisy little shops and street food. We started walking and crossed our first little canal. A little bridge just a bit farther down this canal had 2 wooden posts and a cross beam over it that looked a lot like those in Amsterdam. I took this picture on the way back out of town near sunset. 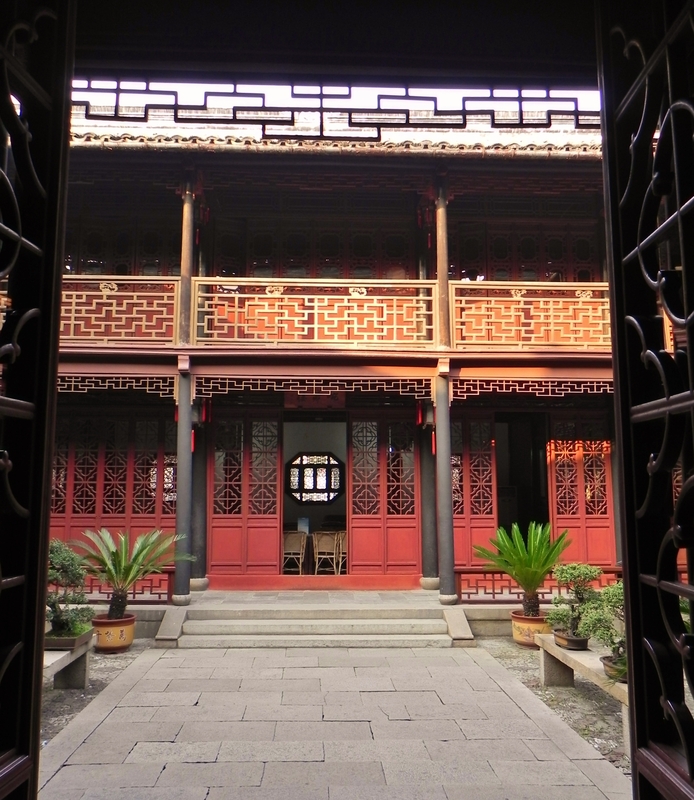 Our first stop in Tongli was a nobleman’s “mansion” named Tui Si Yuan (Garden of Seclusion and Reflection) built in 1886. 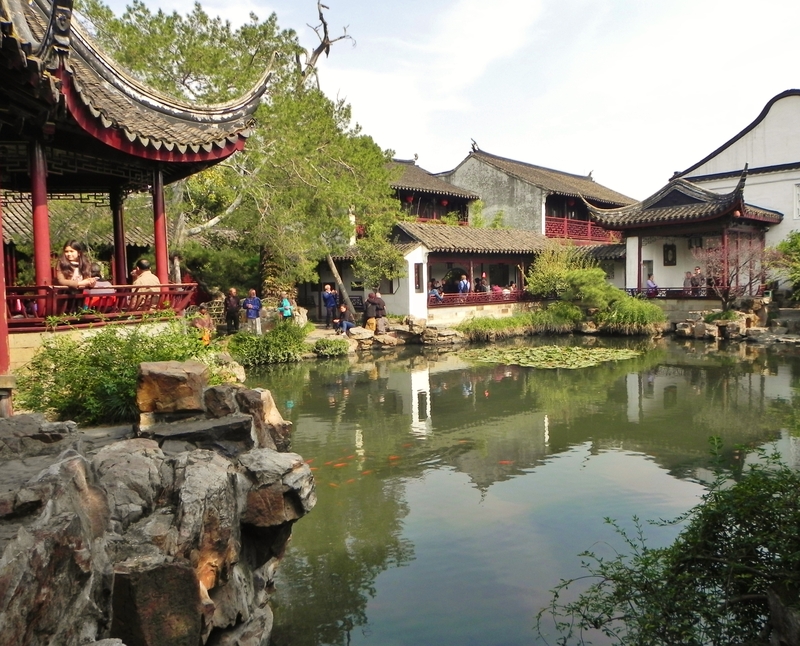 The gardens looked almost identical to the Fishing Nets one in Suzhou, but a little more like someone’s real house. Lots of neat bonsai decorated the courtyards. 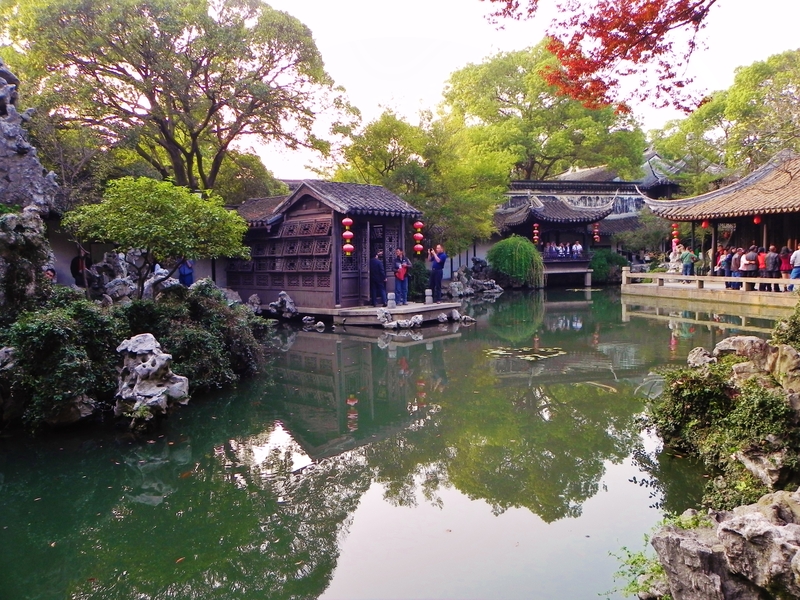 The gardens and central pond were just as beautiful and Suzhou, but a lot more crowded. 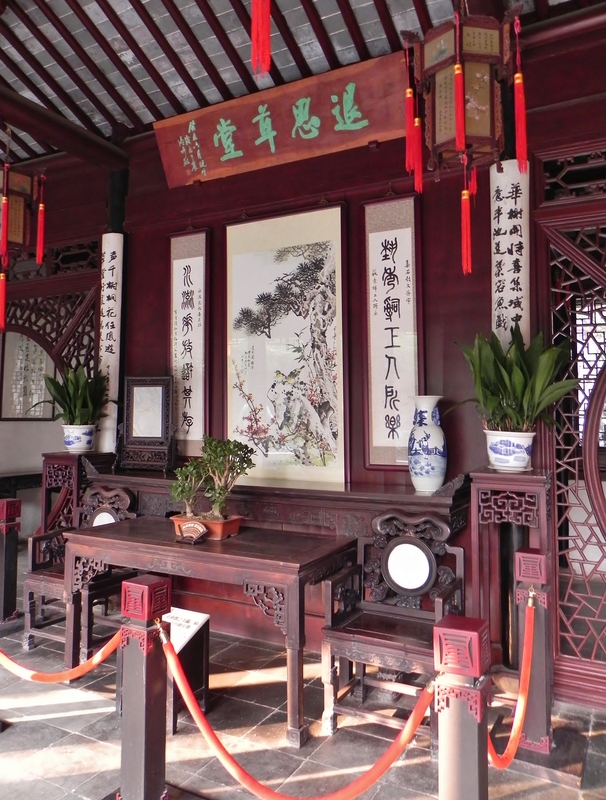 The furniture seemed a little more ornate but pretty much the same as Suzhou, and the rooms were arranged the same, even though this one in Tongli was supposedly a newer house. bow, as that was the only thing moored to the dock. This was a big mistake. I nearly capsized it and everyone had a good laugh. We had a female boat driver who propelled it by moving a large rudder back and forth. Lots of canals and bridges everywhere. I think we made a loop but not totally sure. The houses and shops front right on the canal, or are just behind a narrow street alongside the canal. Lots of restaurants and bars too, with hanging red lanterns. At the spot where 3 canals meet there was a wooden boat docked with what looked like cormorants perched on its gunnels, but the sign there said ospreys. Rocky told us that the fisherman would make the birds fish if you paid him 50 yuan. Seemed a bit excessive. As we were walking across one of the bridges, someone else must have paid him, so we got to watch a fishing performance for free. These birds really do fish. The key is that each bird has a string tied around its throat so he won’t swallow the fish. To begin, the fisherman pokes them off their perches with a long pole, then beats the water where the birds are floating with the same pole. The birds are still attached to their perches by a rope tied to their foot. They dive down, catch a fish, and then the fisherman puts his pole underneath the bird and sort of scoops them up. He grabs them by the neck, holds them over a small fish-hold in the front of the boat and makes them cough up the fish. The fish is still in the bird’s neck, because it hasn’t been able to swallow it because of the string tied around its neck. Amazing – all of the birds caught a small fish this way. It really does work. OK – let’s have it! Back to the bus and we sailed along the highway, for what was supposed to be about an hour and a quarter, but as we got close to Shanghai, traffic came to a complete stop and we crawled. Took a bit more than 2 hours to even get near the city. Earlier in the day, Sandra and Pam had talked Rocky into taking them to see the lights in Shanghai after dark and take us on a cruise of the harbor. Dinner would be after that. Since we were much later than planned (almost now 7:00) DH and I rebelled and said we would take a cab back to the hotel from the Bund instead. Slowly, over the course of this conversation, it came out that the bus driver was going to drop us off at the cruise terminal, the cruise boats leave every half hour and it would take a minimum of 45 minutes, we would not be accompanied, the cruise terminal was 45 minutes from the Bund, and we’d have to find our own way back. This means we wouldn’t be eating until after 10:00 if we were lucky. At this point Pam rebelled too. Sandra still wanted to do it, but finally caved in the end. Thank God! We ate a terrific (but fast) dinner buffet at the Tables restaurant in the hotel. Another curious thing was our guide Rocky. Apparently he was crushed that we couldn’t understand his English all the time, and he developed a terrible headache herding us cats. Seemed devastated. We didn’t get this really. His English was pretty hard to understand, even though (according to him) he’s been doing this for 5 years. I find it hard to believe that we’re the first group to have some difficulty. It got to the point that we didn’t want to ask him to repeat himself because you might hurt his feelings. Poor young fellow! Our flight tomorrow means we have to leave the hotel at 11:30 so the half free day in Shanghai that we thought we’d have to do a bit more exploring is basically non-existent. That’s too bad, as I quite liked Shanghai – will just have to come back.